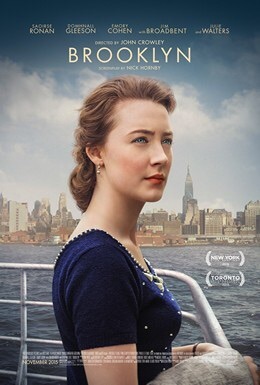 Given the film’s depiction of the joys and promises of immigrating from Ireland to New York boroughs just six decades ago, John Crowley’s Brooklyn (B) should be required viewing for a few presidential aspirants. Saoirse Ronan carries the drama on her capable shoulders and shows her character mature right before our eyes; the actress is rather magnificent in coming-of-age mode. Her central character falls head over heels for a working-class Italian suitor (a charming Emory Cohen), and the film’s primary conflict involves this burgeoning love in The States versus the promise of a different life with another man in her homeland (Domhnall Gleeson in an underdeveloped role). The plot really stacks the deck given the mounting successes of life in America, but the overall journey is enjoyable as Ronan’s character pulls considerable empathy. The art direction and costuming are authentic and lush, and what could have devolved quickly into melodrama is lifted in Crowley’s skilled hands. On both sides of the Atlantic, there are women as peers and elders who want to hold our heroine down, and her ability to be resilient and push forward is inspiring.